Polling in Lakshadweep Lok Sabha constituency, where six candidates are in the fray, ended peacefully today. Around 66 per cent voter turnout was recorded till 5 pm in Lakshadweep Lok Sabha election. The Union territory of Lakshadweep has a sole representation in the Lower House of Parliament. Not many know that prior to the first Lok Sabha Election in Lakshadweep in 1967, the Member of Parliament (MP) from the sole constituency was appointed by the President of India. Lakshadweep has been a stronghold of Indian National Congress (INC) for quite a long time. However, in Lok Sabha Elections 2014, it was Nationalist Congress Party’s (NCP) PP Faizal Mohammed, who won from the constituency. The victory of margin was nonetheless, only 1,535 votes. In 2019 Lok Sabha Elections, there are five key candidates in fray from Lakshadweep constituency – PP Faizal Mohammed of NCP, Sayeed Hamdulla Muhammed of Congress, Sherif Khan of CPI(M), Ali Akbar Konjando of CPI, Dr Mohammed Sadique of JD(U), and Abdul Khader Haji of the Bharatiya Janata Party (BJP). There’ll be 51 polling booths stationed in Lakshadweep for General Elections 2019. The Election Commission of India (ECI) has announced that all the polling stations will use Electronic Voting Machine (EVM), and voters can check their vote through Voter Verifiable Paper Audit Trail (VVPAT), in Lok Sabha Polls 2019. Along with Lakshadweep, people in Andaman & Nicobar Islands, Andhra Pradesh, Arunachal Pradesh, Assam, Bihar Chhattisgarh, Jammu and Kashmir, Maharashtra, Manipur, Meghalaya, Mizoram, Nagaland, Odisha, Sikkim, Telangana, Tripura, Uttar Pradesh, Uttarakhand, and West Bengal will also be voting today. 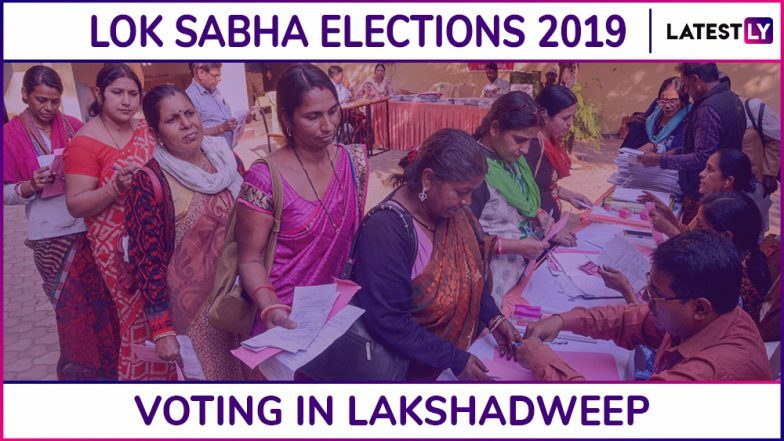 Lakshadweep Lok Sabha Constituency: Candidates, Current MP, Polling Date And Election Results 2019. The ECI, on March 10, had announced that Lok Sabha Elections 2019 will be held in seven phases. The voting in the first phase will take place on April 11, whereas the last phase of polls will take place on May 19. The results are scheduled to be declared on May 23. Stay tuned to LatestLY for all the latest updates about 2019 General Elections.